Designed as an alternative to traditional schools, Akademeia High School has a system of flexible rooms that create an “educational ecosystem” of “ambiguous, multifunctional and inspiring spaces”. “Changes in the public education system in Poland have not kept up with changes in the lives of young people,” said Medusa Group. 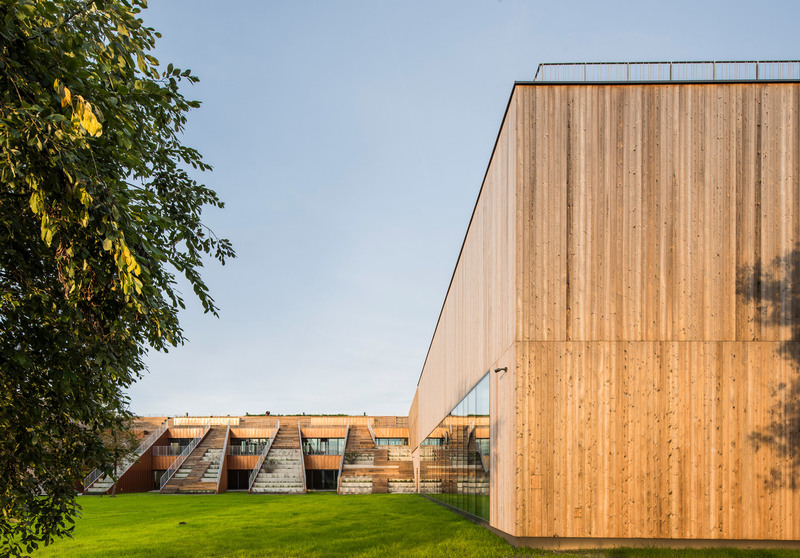 The school is arranged in a C shape around a courtyard, with teaching spaces located in the middle of the plan and the arms at either end containing a canteen and an indoor sports court. 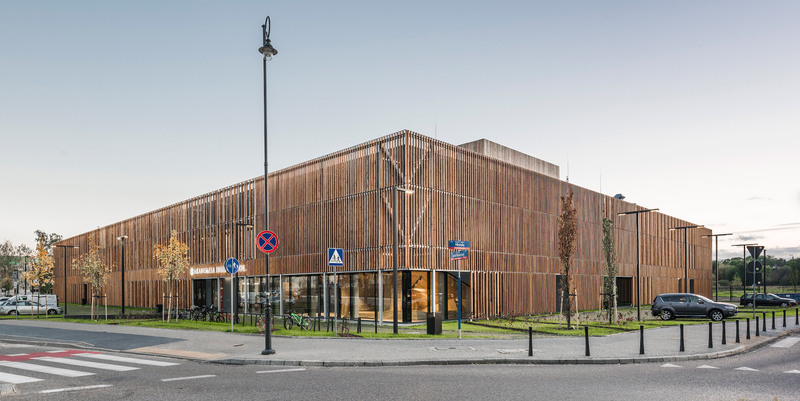 The canteen, which has been designed to be “like a fashionable restaurant”, is used throughout the day, shifting from being a restaurant to a cafe, reading room or performance space. 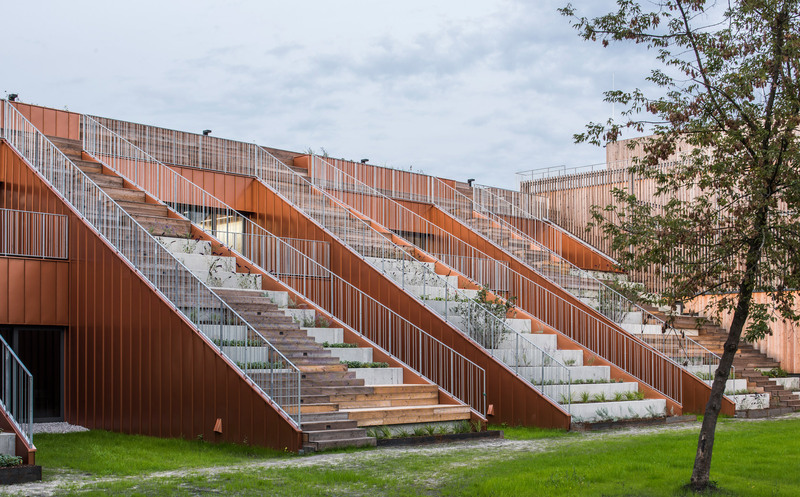 Externally, the school was designed to have both a public, “urban” presence and a private one, with the facade treatment changing to deal with this. At the northern corner, the ground floor has been opened up with glazing, giving views into a dramatic entrance space with an angular wooden roof form and seating areas. “We want young people to sit on what they like to sit on in the city. In the classroom they are sitting on chairs, but there is also an area where you can lie down and sunbathe,” explained the architecture studio. Facing inwards to the courtyard, elevations are still timber-clad but flatter, with large windows giving views across this external space. 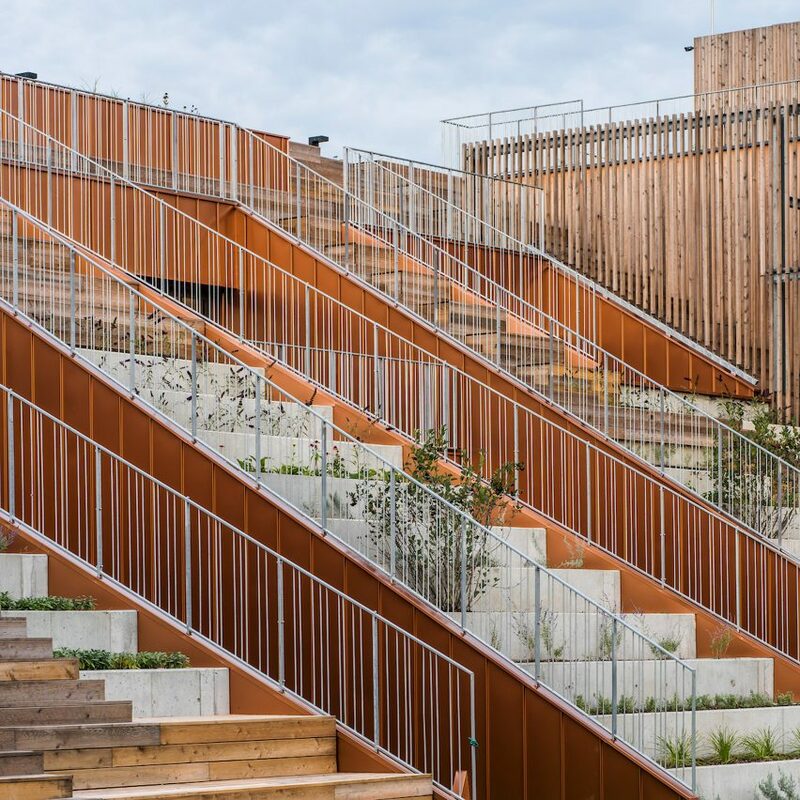 On the north eastern edge of the courtyard, a series of stepped sections provide access up to a green roof as well as amphitheatre-style seating for viewing the courtyard. Some of the stairs have been replaced entirely to create a stepped terrace of concrete planters. The roof garden, as well as housing bee hives, is intended for growing herbs that can be used by the school canteen below, further contributing to the school’s ecosystem. The building achieved a LEED Platinum rating for its environmental and energy-saving solutions. 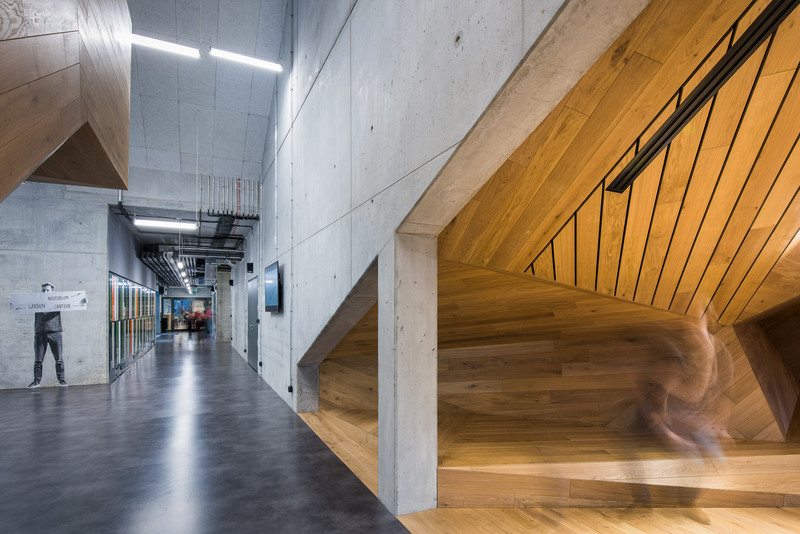 Many new school designs now seek to champion more flexible working spaces instead of a room-off-corridor approach. 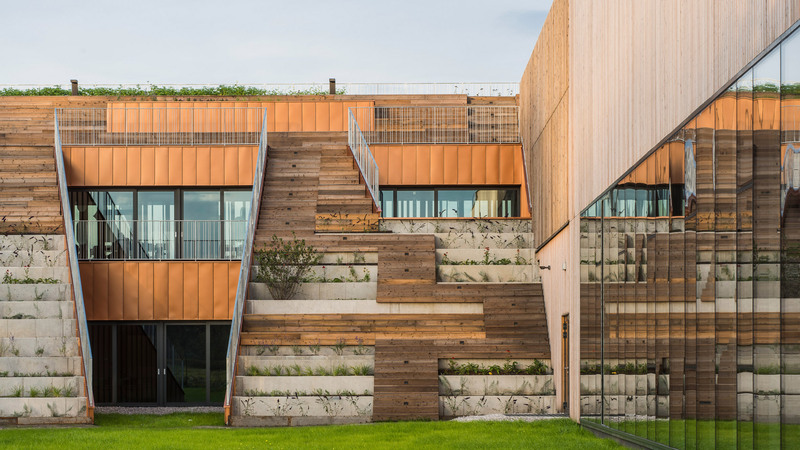 COBE and MVRDV recently built a school in Roskilde inside an abandoned concrete factory, with flexible “creative rooms”. 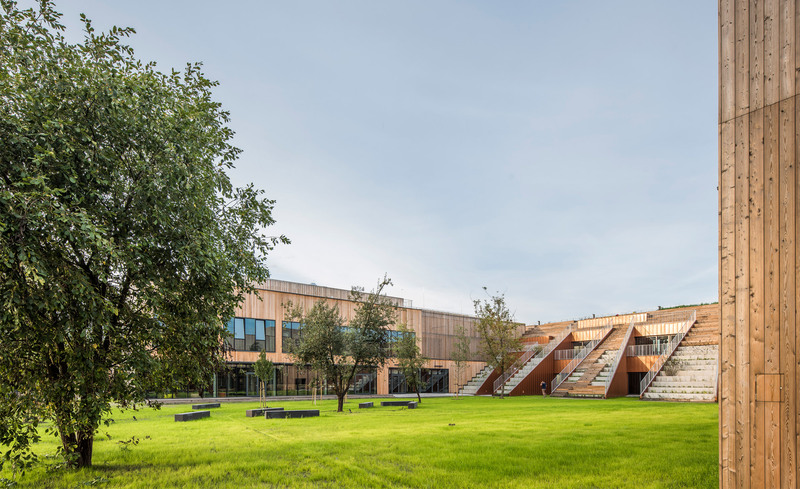 The post Medusa Group designs timber-clad school with herb garden roof appeared first on Dezeen.